Very few British drivers have driven in Formula One for Ferrari. However, of those who have, few have failed to make their mark in the sport's top category. Derek was one of the unlucky ones. Propelled through the junior formulae first by his charismatic stepfather and then by Peter Westbury, Derek starred in Formula Two, catching the eye of Enzo Ferrari who signed him up for the last few grands prix of 1968. However, no regular drives followed, and the next three years saw him turn out for three different teams in only four grands prix, peaking with sixth place at the 1970 US Grand Prix for Surtees. Things looked better for 1972 when he managed five races for the Martini team, but the move bought no success, so he rejoined Surtees for 1974, qualifying only once. 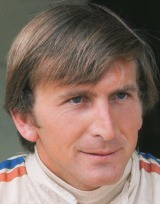 He then looked to sports cars for his glory and has won the Le Mans 24 Hours five times.